Mark Sanchez is a legitimate starting quarterback in the NFL. Mark Sanchez isn’t the issue. here’s why. I’m going to give you 60-seconds to name an active receiver on the Jets without looking it up. I’m going to give you even longer to name two of them. Thought of any yet? No? That’s because Mark Sanchez is working with the youngest and most obscure receiving corps in the National Football League. Chances are you can name a “go to” receiver on any of the other 31 NFL franchises without so much as a stutter. That includes Jacksonville, Cleveland, and Miami. Do you know what makes a quarterback a good quarterback? His ability to get the ball into the receivers’ hands and put it where it is supposed to be. For those of you who are “box score” scouts how much film have you watched of Sanchez this year outside of the broadcasts and ESPN highlights? Have you noticed that receivers aren’t running the correct routes? Have you noticed that where the ball should be, he’s thrown it to that spot? How many drops there have been when they should have been big gains or touchdowns? For a majority of you, the answer is no. Think about this, in Denver Peyton Manning looks human and it isn’t anything physical. He’s got the toughest first half schedule in the league and lets remember, Peyton has never had the arm of Stafford, Cutler or Rodgers; nor the mobility of Alex Smith, Mike Vick and Rodgers. He’s always been able to put the ball where it is supposed to be and run a game as well as any player or offensive coach out there. Yet his receiving corp in Denver has stunted development because “they never really needed to learn routes”. Wonder why that was? I predict that in the second half you’re gonna see a Broncos team primed for a run in that soft AFC West. Sanchez doesn’t have the talent Denver has, and that’s where Rex comes in. To trash Mark Sanchez is to put faith in a place it isn’t deserved. 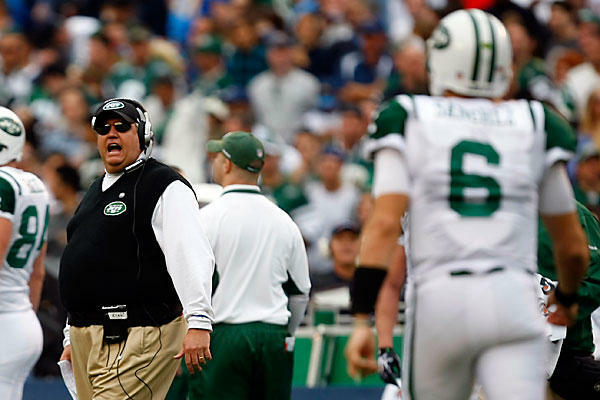 First, we all love the soundbites and bravado of Rex Ryan; but the only thing he has gotten right since becoming the head coach of the New York Jets is sticking with Mark Sanchez. Here’s a man who has decided that the Jets are going to be a “ground-and-pound” team and establish their run game early and often. You aren’t going to do that with Shonn Greene, sir. Hate to break that to you. You also aren’t going to do that by drafting the way you’ve drafted the last four years. You’ve had one impact draft pick in the four tries you’ve gotten as a head coach: Mark Sanchez. What has Rex (and Mike Tannenbaum) given Sanchez weapons-wise for his trouble leading them to two consecutive AFC championship games? Braylon Edwards? Plaxico Burris? Santonio Holmes? Do any of those sound like reasonable number one options in the last three years? He’s also given him zero votes of confidence as he continues to try and “pound it out” without running backs and create competition without giving Sanchez help. This isn’t to say Sanchez is a great quarterback. Tom Brady, Aaron Rodgers, Drew Brees, Eli Manning, Peyton Manning, those guys are great because they make whatever they have work; but Sanchez is good enough to take you to the playoffs and beyond as he’s already done. Rex also can’t sell me on defense and ground-and-pound in a passing league. Especially when you can’t draft effectively to that philosophy and you make signings like the ones you have. Sanchez needs more help than Jeremy Kerley and cornerback Antonio Cromartie, the latter of which had the confusing honor of playing wide receiver this past Monday and attempting to catch his first pass since 2002…in high school (to his credit if not for an errant foot out-of-bounds and a pass off the mark he would have scored). In fact I tweeted on Monday that the most disturbing statistic I heard all weekend was at one point the Jets hadn’t scored an offensive touchdown in 34 consecutive series. Think about that. Outside of Mark Sanchez that means a running back, trick-play, fullback, Tebow, Tae Bo, NOTHING got across the goal line on offense in 34 consecutive possessions on offense. There’s no depth, no run game, no receiving corp and the defense (Ryan’s specialty) has been lackluster. That all points to management. They need to go, and quickly. And if you think Tebow is going to save this ship you’re badly mistaken. At least in Denver he had McGahee, Thomas and a great O-line and defense. He’s got none of that in New York. The Jets are 2-3 in spite of management, not because of it. So New York Jets fans, Rex Ryan, and Mike Tannenbaum this is your cold shower. Concentrate on replacing the real problem, not the person who is causing this to be less of one. Previous Post “Locker Talk” Podcast Episode Two! Next Post “Locker Talk” Podcast Episode 3! This is all fine and dandy, but I watched the Texans game and saw Mark Sanchez miss plenty of receivers, including that Cromartie play, where he had Antonio wide open and threw off the mark. True, the Texans run a good show on the defensive side of the ball, but Sanchez lacked any kind of precision that he needed to have. He also had trouble calling plays on time at home, which means the crowd shouldn’t have had an impact on that like it did on Matt Schaub and the Texan’s play calling. While everything you say about the Jets being terrible is very true, that doesn’t prove anything about the talent and ability of Mr. Mark Sanchez. That entire team needs a reboot, only with the exception of their secondary. I think it proves a lot. Think about what I stated regarding the lack of weapons around Sanchez since he’s gotten there. You draft a franchise quarterback but don’t give him any pieces to work with. You brought up a good point about Monday and how off he was, but you also agree that the Texans aren’t the Bills on defense. You’re talking about a guy navigating an offense with a coach with no idea how to execute a plan/offense and a GM who can’t grasp the concept of building around this guy. A reboot is right, but QB isn’t one of the areas they’re lacking. Personally, I don’t see Mark Sanchez as a franchise quarterback for any team. He is too inaccurate of a passer, throws too many picks, and his arm strength hasn’t significantly improved since college. Also, Rex Ryan isn’t the offensive play caller or the player signing free agents and drafting players, he calls for the defense and motivates the team, so maybe some more criticism for Tony Sporano and Mike Tannenbaum, although admittedly, Tony Sporano took over what is quite possibly the worst position to have in NFL leadership right now. While Ryan isn’t the offensive play-caller, he is the head coach and he does more than call defensive plays and gives motivational speeches. Tannenbaum has had his share of criticism but Rex the purpose of this post was to point out Rex’s deficiency as a head coach. If you think Rex isn’t directly involved in decision making as far as player personnel, scouting, drafting and signing these players then you’re mistaken. Again, as I pointed out arm strength isn’t going to be Sanchez’s strong point, but trust is a big part of a quarterbacks development. In the scheme, the system and his receivers. All three (developed by the head coach and in conjunction with the GM brought in to enact) fall on Rex.